As a peer-reviewed and international research journal, Rare Metals provides a forum for publishing full-length, original papers and invited overviews that advance the in-depth understanding of rare metals and their applications. Papers that have a high impact potential and/or substantially advance the frontiers of science and technology are sought. 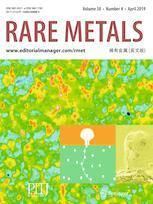 Rare Metals promotes papers precisely and globally to make scientific findings understood by a broad range of readers. Cross-disciplinary research in application of rare metals in functional materials, composites, nano materials, alloys, ceramics. Characterization of structure and properties of rare metal materials specifically as it relates to cutting-edge materials. Development of methodology with potential global impact in metallurgy, synthesis and processing of rare metals.